Lake Chapala, Jalisco, Mexico - Best Places In The World To Retire recently announced the publication and availability for download of the free eBook, Our Year on the Road & Living in Mexico - Adventures, Challenges, Triumphs, Lessons Learned. The book provides the firsthand accounts of Chuck Bolotin and his wife Jet Metier after they sold, gave away, or put into storage 90% of their possessions and packed the rest, along with two dogs, into a big white van, leaving their comfortable house in Arizona, to travel through Mexico. Alan Alexander, Chairman of the Best Places Advisory Board described the book this way: "In this one book, you can experience all the stories and lessons learned by Chuck and Jet while on the road and living in Mexico, from the border at Baja, to the border with Belize, all from the perspective of complete newbies, which is the perspective of most of the visitors to our site. See what they see, feel what they feel, and learn what we learn. We are especially gratified that several stories about the trip have appeared in very prestigious publications, including Forbes, Marketwatch and NextAvenue. We're very proud to offer the stories here, in this book." Jonathan Look, founder of the popular website Life Part 2, who in 2011 sold everything he owned, took early retirement and began traveling the world, said, "Chuck Bolotin has a unique way of combining interesting information, funny stories and practical tips for traveling in a light and readable way. His collection of stories on the joys and travails of traveling in Mexico reflects not on his expertise (because he intentionally had very little before starting his travels), but rather on the proper attitude for thriving while exploring our marvelous neighbor to the south. This is a great book for people new to international travel and life in any country, just like its author was new to it when the book starts." Mike Cobb, Chairman and CEO of ECI Development and trailblazing legend in the living abroad field said, "Chuck Bolotin and Jet Metier undertake a great adventure that most only dream about, 'pulling the rope' so to speak, throwing 'good sense' and 'caution' to the wind. Just like Steve Martin's grandma in Father of the Bride and her rollercoaster story, life is a lot more fun when you get off the merry-go-round and discover the excitement of everyday things. Follow Chuck and Jet's adventure across Mexico to see if you too can make the decision to cut loose and enjoy a more vivid and exciting ride of life." Alfonso Galindo, a US expat living and doing business in Mexico, serial entrepreneur and CEO of North America Trust Bank, said simply, "With its depictions of entertaining people, firsthand stories and useful information, If you're considering traveling or living in Mexico, this book is a must read." 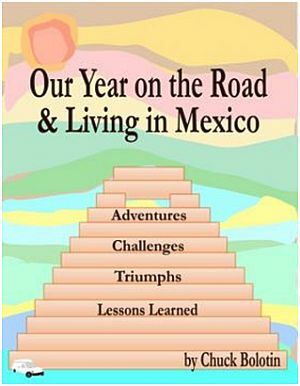 Download the eBook HERE: Our Year on the Road & Living in Mexico. Funded and run by an experienced group of entrepreneurs and investors based primarily in Southern Arizona and utilizing an innovative business model, Best Places In The World To Retire solves the problems of 1) those searching for "no spin," organized, balanced, diverse and credible information about moving, doing business, or visiting abroad; and, 2) for-profit organizations seeking new clients and non-profits seeking new donors and volunteers. The site currently covers the most popular expat destinations in Panama, Mexico, Belize, Nicaragua, and Portugal. Best Places in the World to Retire social media properties include its Facebook page and YouTube channel.